There are some big changes happening at MSNBC. Melissa Harris-Perry will host her own weekend show on the network, starting in February. Harris-Perry is a professor of political science at Tulane University, where she is founding director of the Anna Julia Cooper Project on Gender, Race, and Politics in the South. She’s also the author of Sister Citizen: Shame, Stereotypes, and Black Women in America. Harris-Perry has been a frequent guest on other MSNBC shows where she is offers a consistently strong analysis on progressive issues and a cogent critic of the racism in mainstream politics. 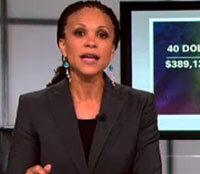 This is the first time that an African American woman has had her own show on MSNBC. Harris-Perry follows in the footsteps of other African American firsts, including Carol Jenkins whose career included 23 years as co-anchor of the 6 p.m. newscast and her own local show. 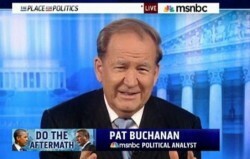 During the same week, MSNBC announced that Pat Buchanan is “out indefinitely” at the network. We’ve written quite a lot about Buchanan’s racism here (and here and here and here) before, so of course, it’s not a surprise to us or regular readers here that Buchanan has some pretty deplorable views. He’s also been the focus of an ongoing campaign by progressive organizations CREDO and ColorofChange to have MSNBC to remove him from airing those views on a major cable news outlet. I couldn’t agree more with Griffin on this point. This is part of the argument that we’ve been making about Buchanan for a long time here. It’s not a free speech issue to take away Buchanan’s platform. He doesn’t have a constitutional right to a spot as a commentator on a cable news show. By allowing him to air his views, the network effectively skews the terms of the debate to the far-right for viewers of that show. While it’s quite possibly (likely even) that Buchanan will find a welcome audience for his views over at FoxNews, I still think it’s the right decision (if belated) for MSNBC to suspend him. Griffin should look seriously into Buchanan’s views over the long term and make the next right decision, which is to fire him. The combination of these shifts at MSNBC – Buchanan out, Harris-Perry in – signal a shift in the direction of a major news outlet. Only time will tell if this contributes to a shift in the conversation about race at the network and in the broader arena of mainstream political discourse.